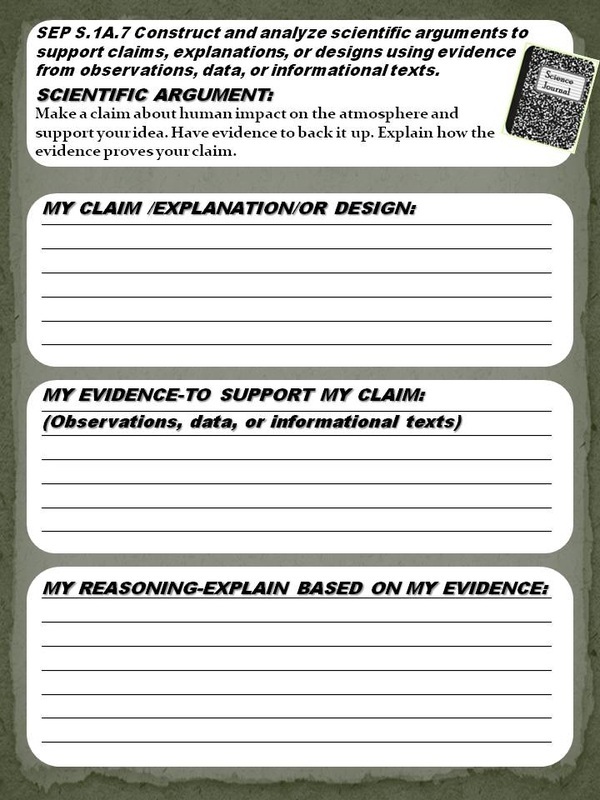 6.E.2A.2 Critically analyze scientific arguments based on evidence for and against how different phenomena (natural and human induced) may contribute to the composition of Earth’s atmosphere. Greenhouse gases in the atmosphere absorb and retain the energy radiated from land and ocean surfaces, thereby regulating Earth’s average surface temperature and keeping it habitable (greenhouse effect). This effect can be enhanced by an increase in the gases that trap heat in the atmosphere. Additionally, the composition of Earth’s atmosphere has changed over Earth’s history, particularly the amount of ozone in the stratosphere. The following evidence can be found to support and refute this phenomenon. - Volcanic eruptions affect the atmosphere by releasing ashes, which contain harmful chemicals and large amounts of carbon dioxide (a greenhouse gas). - Human activities, such as the release of greenhouse gases from burning fossil fuels and the use of aerosol sprays also contribute to the change in Earth’s atmospheric composition. Life on Earth could not exist without the protective shield of the ozone layer. This gas absorbs harmful UV rays, which harm plants and animals. Human health problems such as skin cancer and blindness can be attributed to a decrease in the amount of ozone. Volcanic eruptions and the burning of fossil fuels can cause air pollution. This pollution can cause human health problems such as respiratory diseases. Volcanic ash also contains particulates that can reflect sunlight and result in a decrease in surface temperatures. Human activities can be harmful or beneficial to the atmosphere. When humans clear cut and burn forests, more carbon dioxide is released into the atmosphere. Planting new plants can help to absorb carbon dioxide from the environment. Students should be able to research and explain the positive and negative effects that we have on our atmosphere and how these changes can affect life on our planet.